It is that time of year again. Time to start thinking about filling your 2008 tax return. It is also the time to take advantage of last minute deductions. Do not wait until you HAVE to look at your taxes. You may benefit from taxing steps prior to January first. One of the quickest and easiest ways to add to your 2008 deductions is to pay your January 2009 mortgage payment during the month of December. By doing so, the interest on that payment is deductible on your 2008 taxes. This has made a substantial difference a couple of times for me in the past by reducing my overall tax rate by a couple points. Have you been thinking about a new PC, laptop, backup device, or phone for your at-home business. Purchasing them before the end of the year will allow you to deduct its costs as a business expense. Obviously, you need to have a business to accomplish this, but anyone with a home and a skill can have a “business”. In order for the IRS not to consider your business a hobby, you need to turn a profit after a couple years, and have the intent to make money. Play your cards rights, and some of your Christmas gifts may possible be deductible. The Holiday season, but that doesn’t mean you can’t receive a little benefit from it. Many years we clean out the old toys from the kids room prior to Christmas, because is seems that every year new stuff arrives on the 25th. We donate these to a non-profit charity, which allows us to deduct it. Also, this year we are donating the kids old bikes to the local Sheriff Office for the Bikes for Tykes program. Here they have prisoners from the local jail, get the bikes up to snuff to give to the less-fortunate. If you are lucky enough to still get a Christmas bonus in the crap-tastic economy, and don’t need it to keep the lights on, you should consider sheltering it from increasing your taxable income. You can do this by contributing it to your company’s 401k or an IRA. 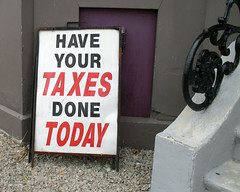 All in all, take the time to look at and estimate your taxes prior to the end of the year. Many years, I’ve been right over the line of a new tax bracket, and doing little things like above can knock me down a notch, at least for a year.